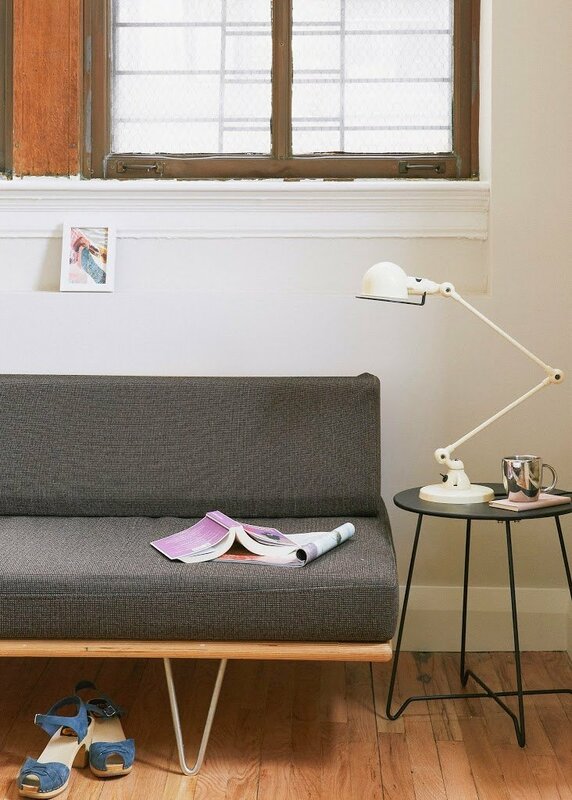 On falling in love with the apartment: We needed a three-bedroom apartment close to New Jersey, since my husband works there. Liem, my seven-year-old son, loved the “mysterious hallway” (you have to walk through twists and turns after the elevator to reach our place) and my husband Rich loved the skylights. We fell in love when we first saw it and put in an offer. It feels like an oasis from NYC. I think we’ll live here forever. Our kids will grow up here. Sofa: The Future Perfect. Coffee table: CB2. Side table/stools: HORNE. Oversize chair: Vintage, upholstered in Romo fabric. Rocking chair: Jason Lewis Furniture. On creating a relaxed home: Originally I wanted the space to resemble a white Parisian apartment, but then I realized I didn’t really like white! I wanted it to be cozier. Plus, I don’t like worrying about the kids and telling them to be neat all the time. It’s better when you can have an apartment that wears in and ages along with the kids. 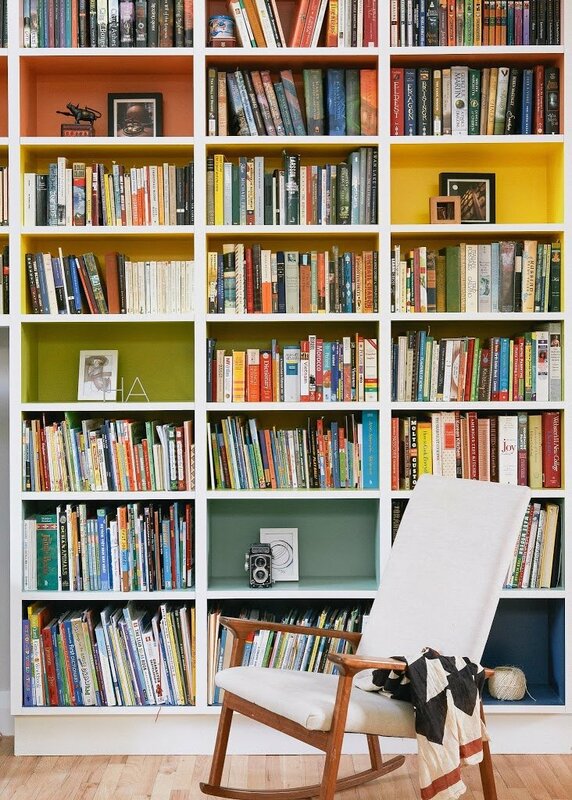 On the colorful bookcase: As soon as we started designing, I knew we’d build a bookcase and that it would be a rainbow. I don’t know where that came from! My business partner Michi and I have paint swatches at work, so we spent an afternoon picking out what we thought was nice, and brought them here to see them in the light. It worked! I loved it from the beginning. My husband Rich was a little nervous because the books were the last thing we unpacked, so it was a full-on rainbow for a really long time. On entertaining: We have friends over a lot. I cook Vietnamese food, and I’m always making kale salad at parties. A couple months ago, I discovered triangle tarts made of puff pastry for dinner parties. You can make the fillings a couple days in advance—ground beef and mushrooms, or potatoes and peas, whatever you’d like. They’re great with the kale salad. Table: The Future Perfect. Black dining chairs: Jean Prouvé. Upholstered dining chairs: ABC Carpet & Home with Maharam fabric. 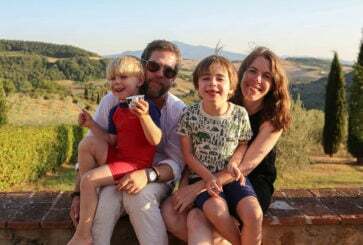 On evening rituals: My husband and I usually have dinner after the kids go to bed. We catch up on the day, and then we’ll just putz around. I putz a lot! On hanging out: We spend a lot of time at the island. The kids sit here while eating their breakfast and snacks, talking to me while I cook and doing their homework. On feeding kids: I’m reading the book It’s Not About the Broccoli, which is about teaching children healthy eating. My kids don’t have very good eating habits, so we’re working on that. We practice rotation (when you can’t have the same thing twice in a row) and talk about the differences between growing foods, fun foods and junk foods. For example, yesterday we had waffles, so we can’t have waffles again today. When kids get so used to having the same tastes over and over, they get scared to try new tastes. Liem said he tried calamari at school, so I guess it’s working! 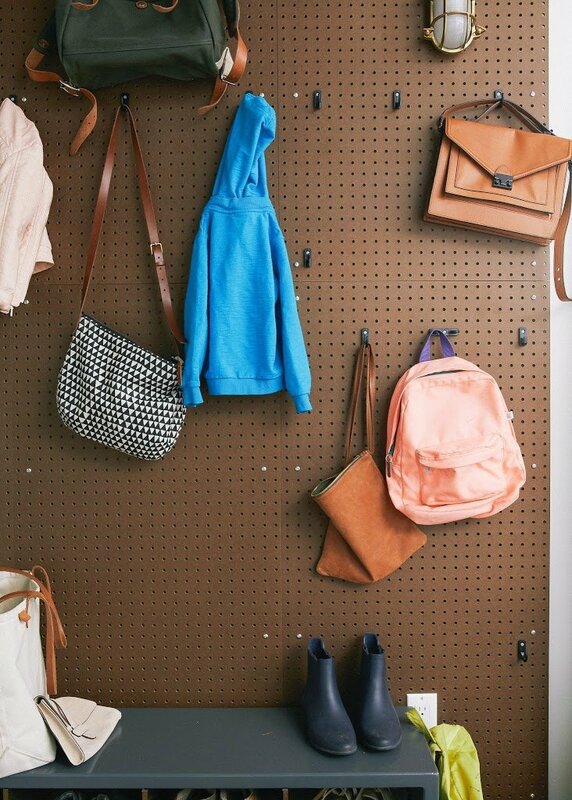 On helping kids stay organized: We keep industrial hooks by the front door. The kids have their own hooks. We also have bins for their hats, scarves, mittens and school supplies, so they know where all their stuff is. 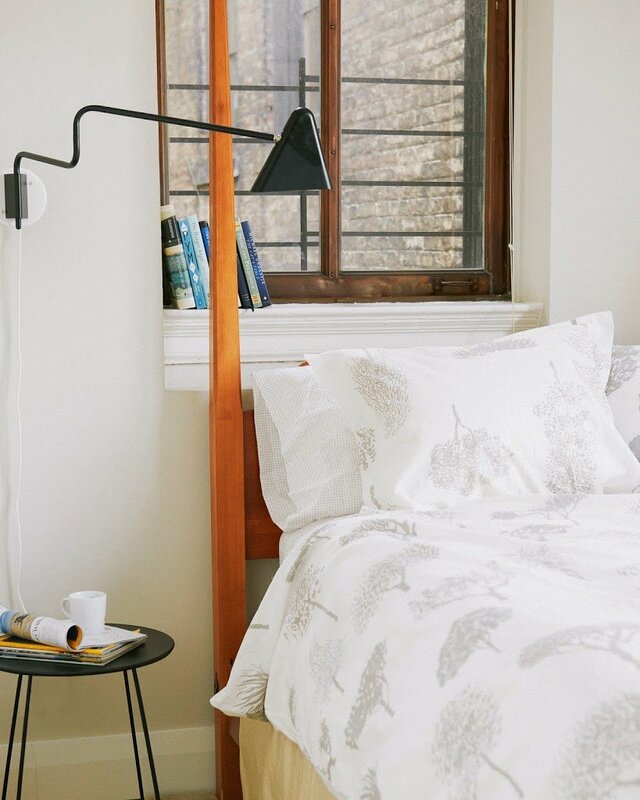 On comfy sheets: For our master bedroom, I love white cotton sheets. My favorite thing is freshly laundered sheets. If it weren’t completely decadent, I’d wash my sheets everyday. Bed: West Elm. Bedside table: West Elm. 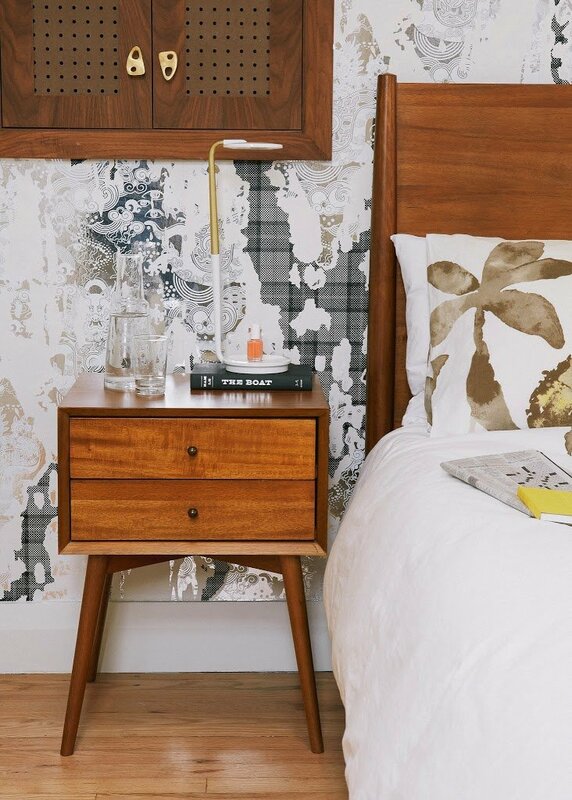 Bedside lamp: Design Within Reach. Wallpaper: FlavorPaper. Duvet cover: West Elm. Table lamp: Horne. Day bed: Design Within Reach. 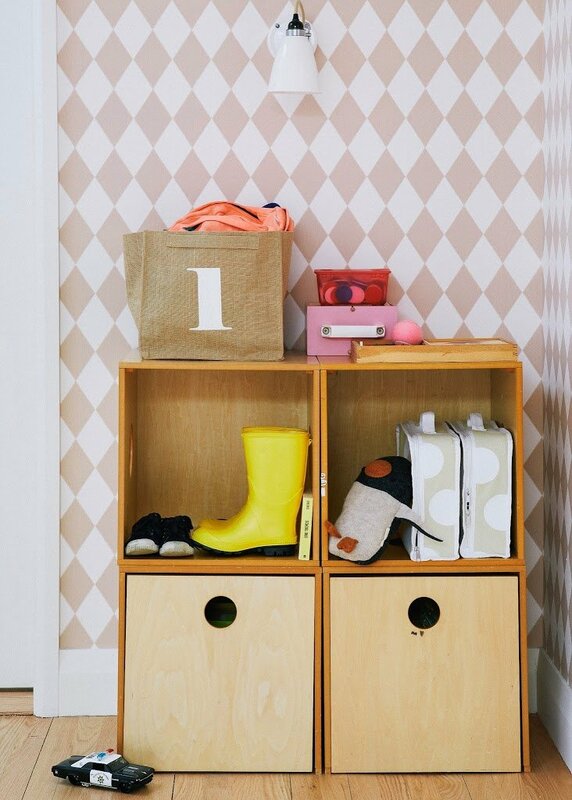 On the genius of bins: In our hallway, the kids keep their toys in storage bins. We get bins everywhere—The Container Store, Land of Nod, Anthropologie, P’kolino. We bring a few toys into the living room when they want to play, so they’re never overwhelmed by too many toys at once. And our living room stays relatively clean! Pendant lamp: Pieces. Wallpaper: Ferm Living. Numbered storage bin: The Land of Nod. Dotted suitcases: The Land of Nod. 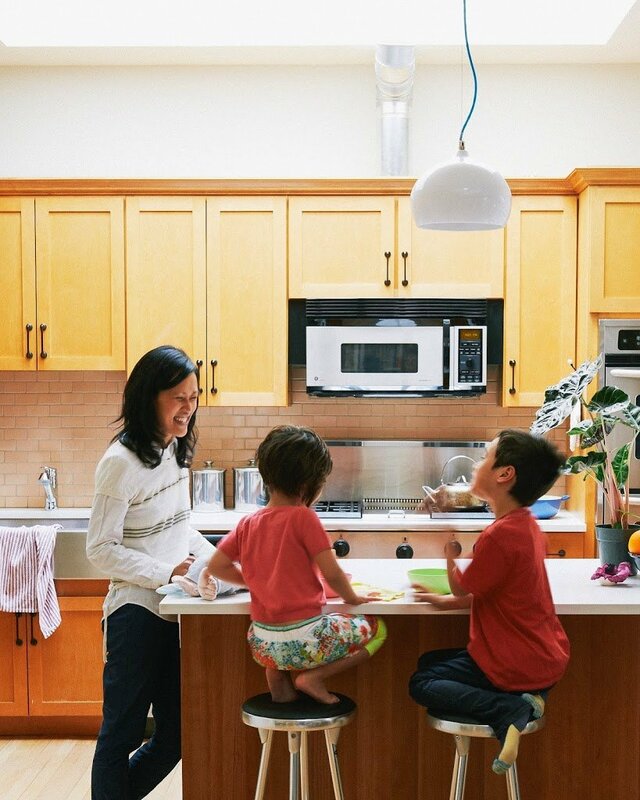 On sharing a room: The kids will share a bedroom until five-year-old Ai-Linh wants to sleep alone in the other bedroom. She tried it for one night, but then made Liem sleep with her and never went back. For now, they like sharing this room. They’re happy. Their whole routine is together—they brush their teeth together and then they read a story. They’re still babies together. 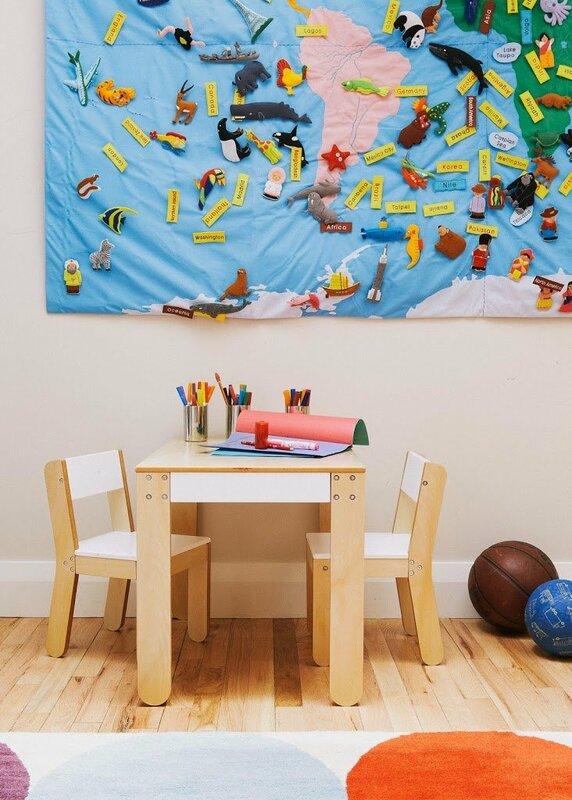 On finding kids’ art: I get art from 20×200, which sells prints for $20. It’s easy to create themes. If you want to do all animals or transportation, you can buy different styles and put them all together. We have a lot of baseball prints! On playing together: On Saturday mornings, they get to watch TV, so we can sleep in! They’ll snuggle under the covers in one bed and watch a show together or one will play a video game and the other will watch. Ai-Linh is also into her stuffies. She plays with a different stuffie every day so none of them feel lonely or left out. Table and chairs: P’kolino. World Map: The Conran Shop. Rug: The Rug Company. Bunk bed: Costco. Cloud and bird pillows: The Land of Nod. Eames Rocker: Design Within Reach. On telling secrets: When we were moving in, Liem really wanted a way to talk between the bedrooms, so I told him I’d make him a speaking tubes between the rooms. (A tube actually goes through the hallway wall to the guest room!) When they have friends over, they’re a bit hit. On making a guest room comfortable: I’ve heard that you should sleep in the guest room yourself before you have guests. I tried sleeping in ours and discovered there’s a draft! So I put an extra blanket in there. On favorite home stores: I always do a round of CB2, West Elm and Crate and Barrel. The store I really love is The Future Perfect, but they’re really expensive. I like Horne. I love the Rug Company—even though I can’t afford their rugs, their patterns are really inspirational, so it’s fun to go look around. Side table: The Land of Nod. 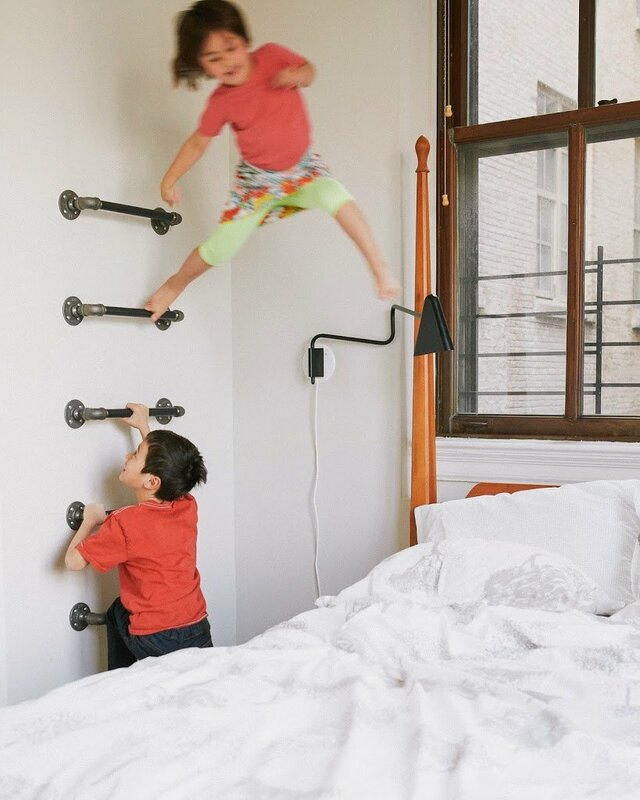 On a place for jumping: The kids asked for a climbing wall, so I made a wall ladder in the guest room. They’re jumpers—they jump off everything! On career advice for budding architects: Trust yourself and your expertise. Be firm in your convictions (don’t let a grumpy old contractor tell you how to build that wall). Find good people to work with, people who will support and believe in you. Find other women who are practicing in the field, and look for role models and mentors who you can talk to about what it’s really like. Thank you so much, Yen! Your home is wonderful! P.S. A San Francisco apartment tour, and another NYC apartment tour. I have always wanted a wall full of books since I saw my grans which is beautiful! The rainbow just make a this one so much cooler and fun! I love it! My kids would trade the dog for that bedroom ladder! What a blast!!! Your apartment is so cute! I love everything about it! Is the diamond pattern on the wall painted, or wallpaper? I love the bookshelf in your living room. 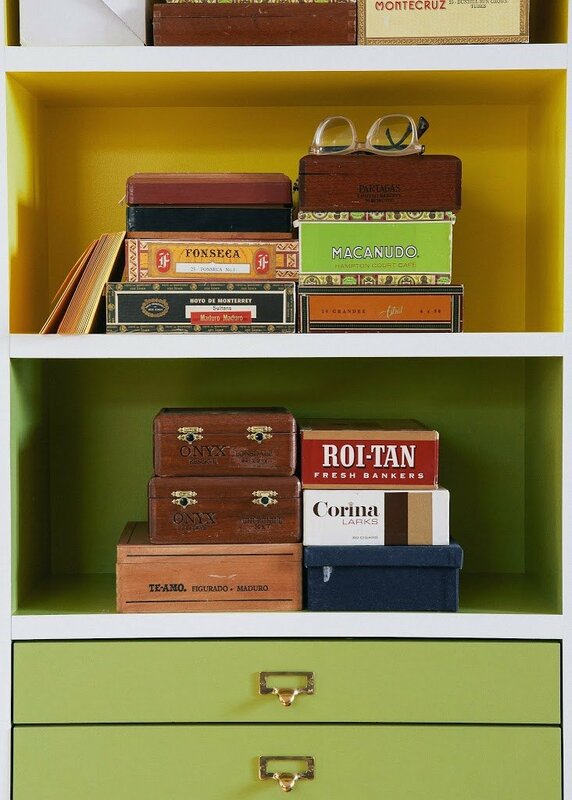 The colors are such a nice touch, I have never thought about painting the inside of a bookshelf before! It is amazing that people in New York are able to live in apartments with their families. I am used to a lot more space than that. I would love to give it a try sometime. That book shelf is seriously to die for. I love it. Can any apartment in New York be made to look this nice? I’m moving out there soon and don’t even want to start looking. If you try yourself to check into some of the finest New York City apartments then you’ll be quite mesmerized to find some of the best well designed and furnished apartments also one can find some of the finest housing for interns in NYC. amazing! Where can I find the black and white triangle bag?!? Great post + great home! I see a Caitlin Wicker Sweatertoy plush penguin on that bookshelf. Would you please include my link? This space is wonderful, and feels so very homely. 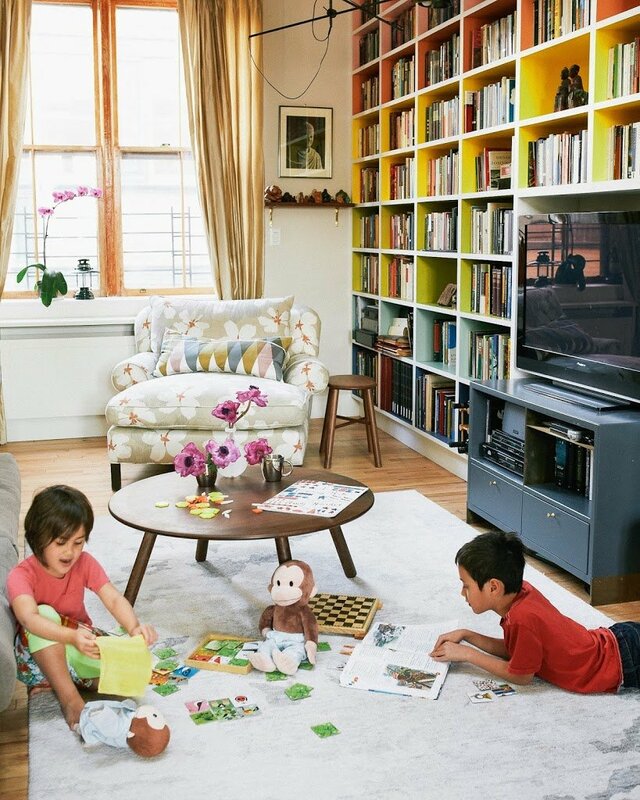 Especially love the bookshelves – a great addition to a home with young children! Lovely! Such a happy space! This is such an inspiring home! 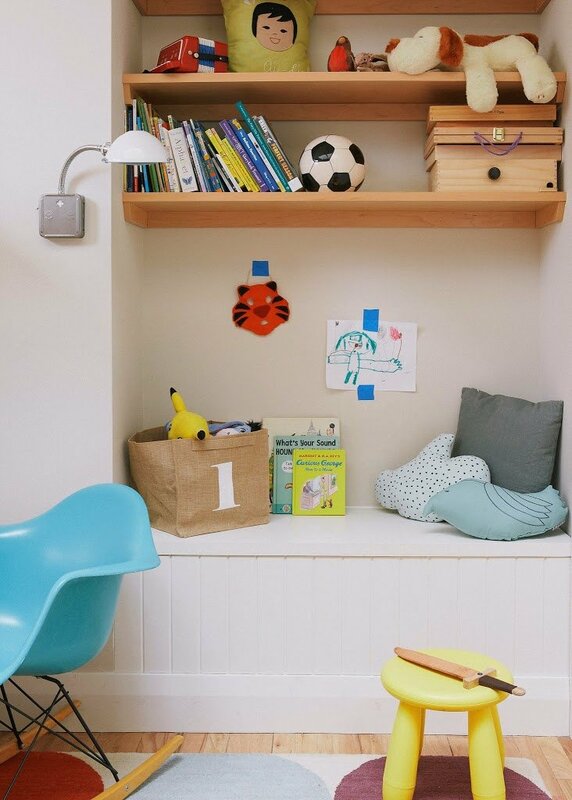 Love the color everywhere and the special touches for the kids. Nice work, Yen! Great place. Here’s some advice: Eat together as a family!!!!!!! Joanna, we spy our Flock scarf in black + red on her adorable rocker; would be so generous as to credit us? We’d be so thrilled! Please, where is the lamp in the guest room from? 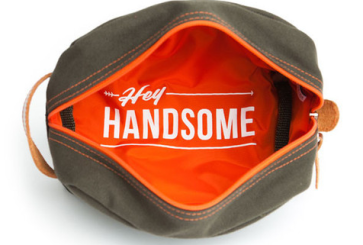 Thanks for the bag link!!! Incredible bookcase. I love it! Color is the way to go. Also, the climbing ladder on the wall is brilliant! It’s so much better to make something safe for kids to jump from rather than leave them to their own devices. I was sad, though, to read that they don’t eat dinner with their kids! Why not? That’s the best time to teach healthy eating habits and to have good conversations with your kids. Gotta eat at the table for EVERY meal. What a wonderful and fun apartment! My little guy would love the climbing wall. Where are the brackets from? gorgeous! 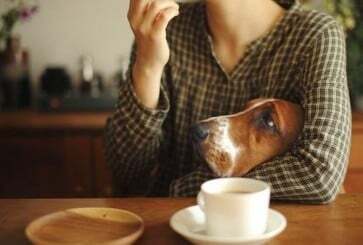 I’m so curious by those who say they eat late with their husbands. What do the parents do while the kids are eating? Do they sit with them? Or do other things? 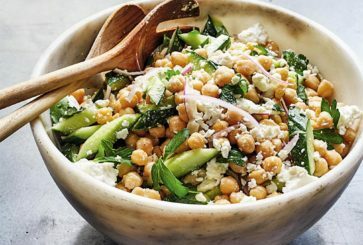 Do the kids eat different meals than the adults? We always eat as a family and eat the same meals (occasionally hubby and I will have a different side), have since the kids were born. Wow, what a cool apartment!! A beautiful bookcase is always the way to my heart. It really helps create a warm and inviting space. This apartment is AMAZING! Whenever I see these tours I can’t believe the homeowners did it themselves! I wish I could make something half as nice, it’d be great if you did a series on decorating basics, like how to put together a simple room for the design challenged. I have these concepts in my mind but when I DIY it never comes out quite right. 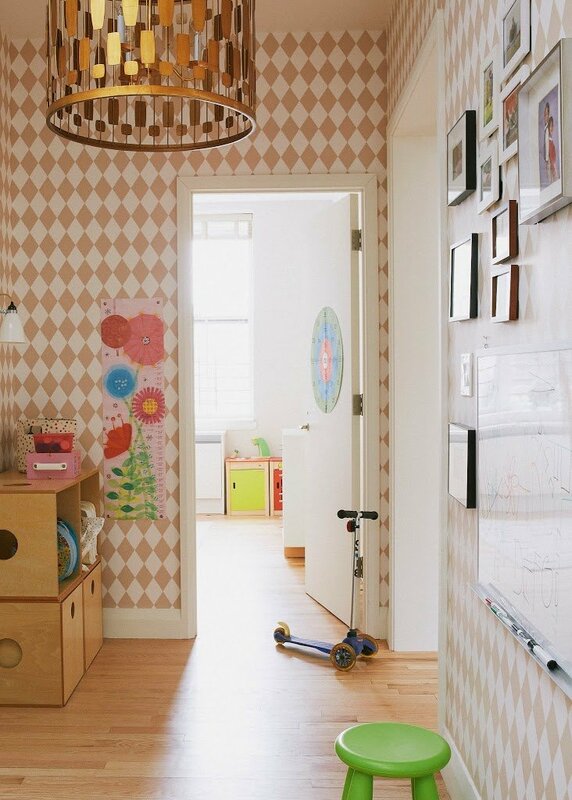 I love the Marimekko bedding in the kids` room! 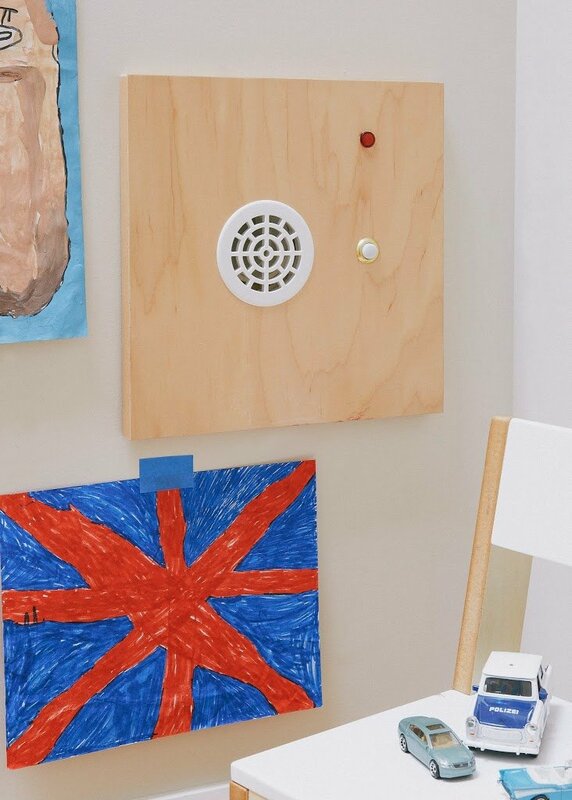 Bravo to her taking suggestions from her kids and using it as inspiration to create such cool things for their home (I especially love the talking tubes and climbing wall). What a lovely, happy home. Wow. 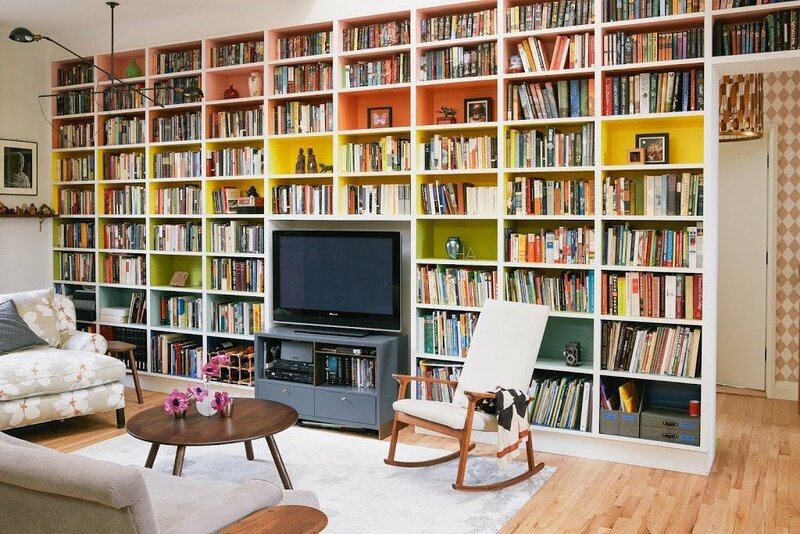 I looove the rainbow bookcase. What a lovely apartment. I like the colours that Yen chose for her bookcase. When I read that it would be rainbow, I thought it would be more childish. 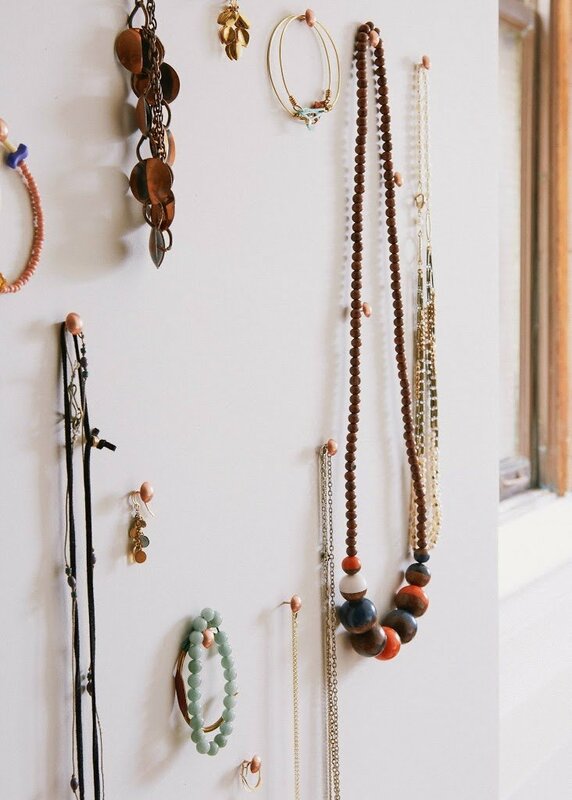 I like the simple yet pretty decor that she has chosen. this apartment is so inspiring as i have an urban (chicago) condo and two small children. we hope to stay here until they are grown up, too. 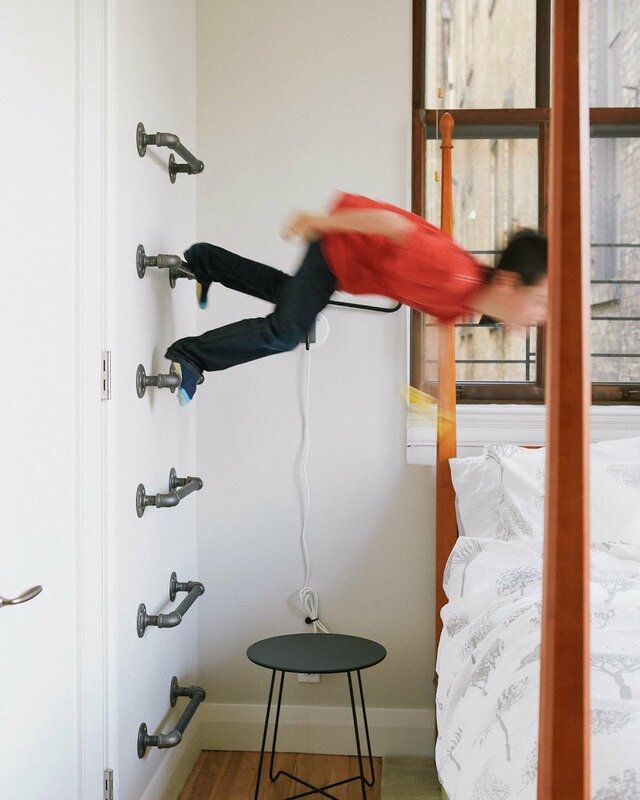 the climbing wall to the bed is ingenious and we definitely have the perfect wall to put a tube through ;) i found the comment about “practicing rotation” a little funny since we don’t have a name for it in the midwest – we just do it. I love that there is color but not too much. And the climbing wall. How cool is that? I love how playful this apartment is! Kid paradise, but stylish too. my favorite tour yet! what a gorgeous home. i really love how she incorporated her children into the space. what a beautiful home! and as a fellow architect, I love that you included your favorite places to shop – I find my budget doesn’t always match my taste : ) thank you, Yen, for sharing your home with us! Oh, Yen … A friend, an inspiration, and a delight <3! What a home! I’m taking notes for my future apartment. The rainbow bookcase is just amazing; as is the climbing wall 0:). Wow, it is so great to see you feature an architect ! As one (a young one, even a baby one, as my mom puts it), it is really inspiring to see ! My brother & I shared a room until I was about 12/13. Being in a military family.. we moved a lot… so housing was varied. But usually, there was our room.. and then a guest room/playroom. It was nice to keep the bedroom for sleeping and the playroom always had a lot of space for fun. i love it. this place is bonkers. Apt looks great! And I particularly like the bookshelves. Did all design them yourselves or did you buy them? I plan on building/buying built-in bookshelves and would love to know. Thanks! Gorgeous! But what caught my eye was the triangle print crossbody bag in the photo from her pegboard. Anyone know where it’s from? I love the bunk beds! Inspired to try them here when my boys are old enough! So many inspired ideas! Thanks for sharing. I’m sold on that jumping wall! My boys would go crazy over that! Love the whole tour! That apartment is just plain fun!Love the tours you do… keep them up and thanks! This is gorgeous! LOVE that bookcase – brilliant!! This is lovely! 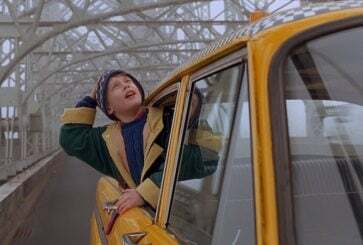 I really hope to have a cozy apartment in Manhattan for my kids to grow up in. 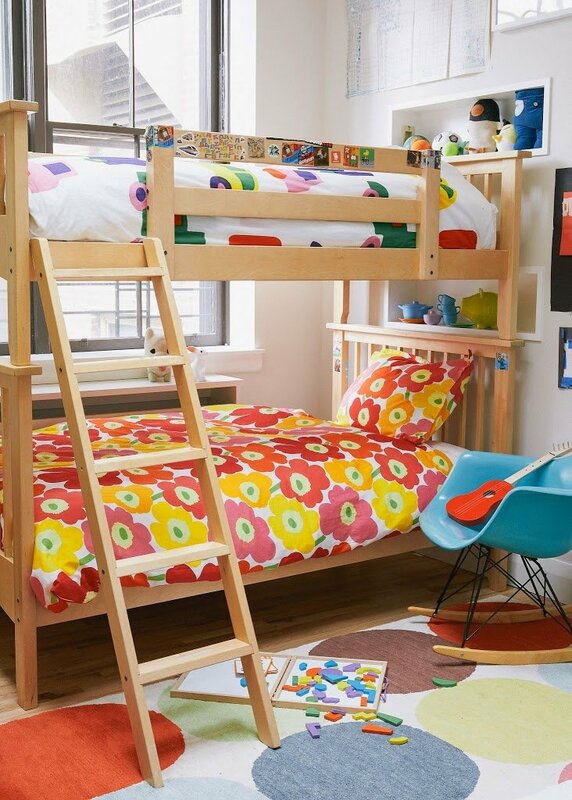 Love it and love the Marimekko bedding for your daughter’s bed. My daughter has the red and pink set. Beautiful home! 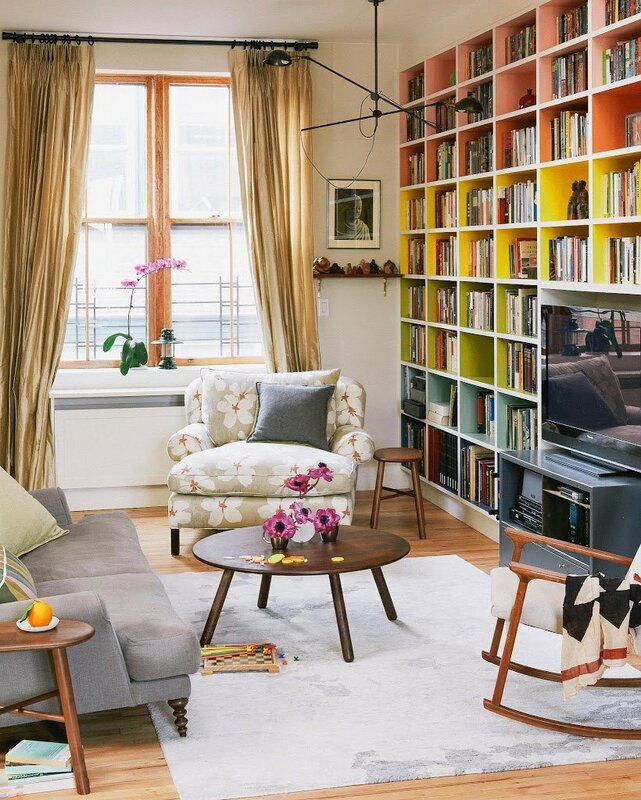 The rainbow bookcase is such a lovely pop of color! I hate that less and less people have bookcases now with kindles and such. Also I would’ve LOVED that ladder as a kid. I climbed everything in sight! 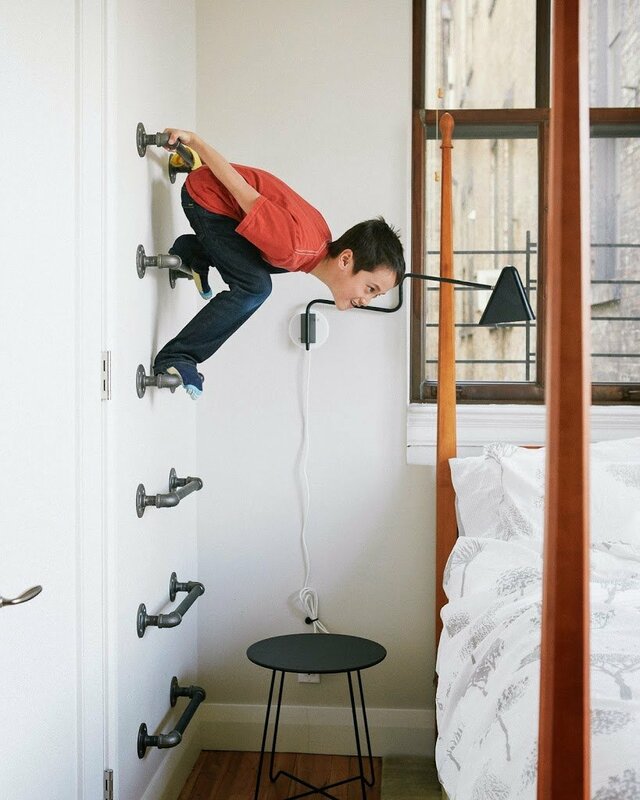 The wall ladder is GENIUS!!!! It looks great but is so fun, my son would love that! 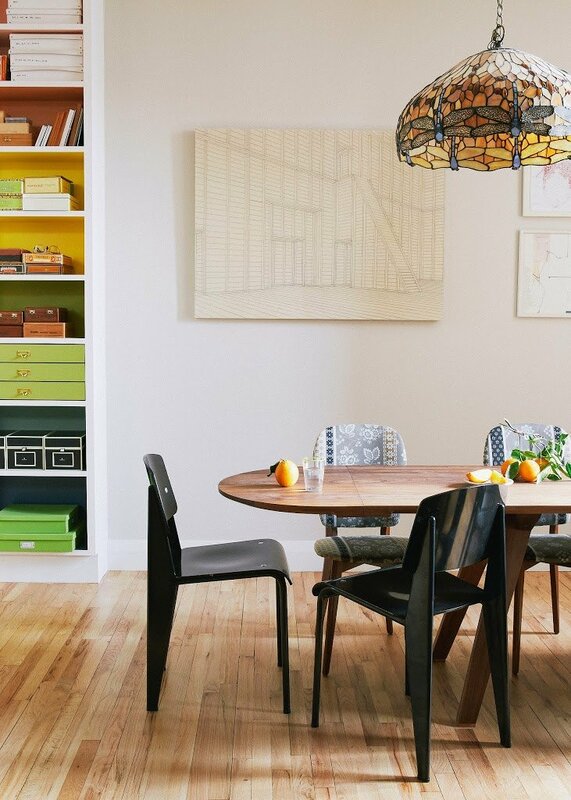 What a really wonderful family home, so many practical ideas but so stylish too, I really love it. 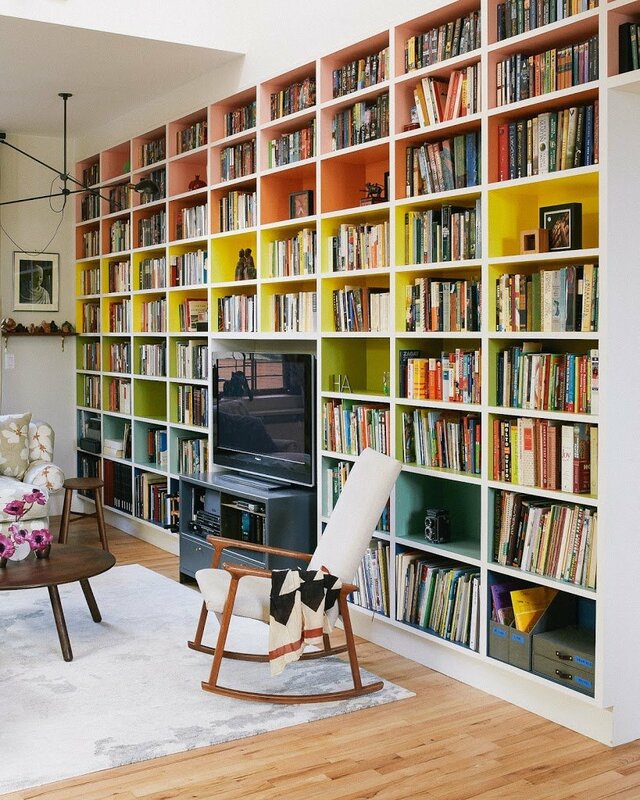 And the rainbow bookcase….just wow!! Just when I thought I couldn’t be amazed by rainbow infused apartments, you show us this :) So pretty and cheerful!! Wow – it’s playful and cozy but with such a sophistication about it! I would happily spend my days here… and the climbing wall is just brilliant! Thank you for sharing! It makes me want to remodel and redecorate our place!